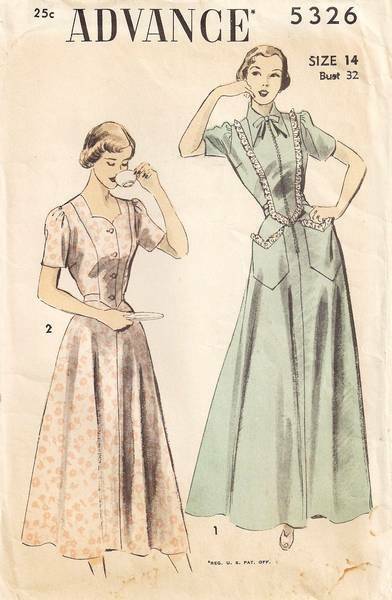 Vintage Advance sewing pattern number 5326. House dress with sweetheart neckline features buttoned center-front bodice. Softly flaired four section skirt and tied ends extending to back. Short sleeves gathered at shoulders. Full length Housecoat with pointed collar has front zipper closing, patch pockets and self fabric bow at neckline. Pattern pieces are unused and the pieces are in original factory folds. Envelope has some color aging but is solid and complete.